As I have now a larger collection of figures, I worked on a scenario for a big table. 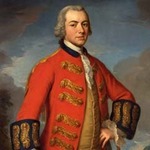 In June 1744 prince Charles was pushing the allied army under Coigny and fieldmarshall Seckendorff back. During the first days of july Nadásdy was send to prevend Coignys retreat into the Alsace. Therefor he launched an attack on Wissembourg. The town was captured shortly before the allied army arrived. In the morning of the 5th of July a French detachement under Catelet was wiped out. When Nadásdy recogniszed that the allies came with their whole army to attack his small Corps he decided to retreat. Fortunately for him in this very moment a message came from prince Charles with the order to fall back and open the way for Coigny to retreat into the Alsace. Nevertheless Nadásdys troops were very headstrong. The garrison of Wissembourg/Weißenburg under their colonel Forgách refused to leave the place which they occupied some hours ago. Nadásdy decided to give up the idea to reinforce the town because that would be a trap. Even without Forgáchs batallion (which was captured at the end of the battle) he had to deal with the other troops holding the line between Wissembourg and Altstadt who refused to fall back too! Perhaps the poor performence of the French and Imperial army at this day persuaded the austrian soldiers that the french were too weak to storm the Austrian positions. The allies outnumbered Nadásdy extremely. Nadásdy had not 10.000 men under his command. Coigny commanded nearly the whole French army on the river Rhine reinforced by the imperial army under the old fieldmarshall Seckendorff and the Hessian corps under Generalmajor von Waldenheim who was shot at this battle. It is very difficult to make a scenario reflecting all the aspects of the real attack of the French. The main Task of Nadásdy was (and is for the tt-game) to hold Altstadt Long enough to hold the way of retreat open, when he managed to order his infantry to retreat. To defend the position on the Austrian right was crucial to the outcome of the battle. I use the word "battle" although the Austrians had only a small corps into action. But the French had to use nearly their whole army and the allied casualties were really significant like after a major battle of the war. Thanks for posting this damnitz. Looks like another cracker. After our refight I would change only, that the austrian brigade under Puebla (II) have to roll again for every unit that should move backwards if the whole brigade rolled better than a 1. I think that the scenario is now tested enough to be called recommendable. Please notice the small changes in the scenario (Bavarians can and not only should move forward in the 1st turn)! Try to play 7 or 8 turns if you wish. dindin recommended that change, although I think, that the French have a chance to win in 6 turns too. But I'm eager to play this scenario again! It was so enjoyably exciting!